Your dentist will first apply a local anesthetic, then use a drill to remove the decay. 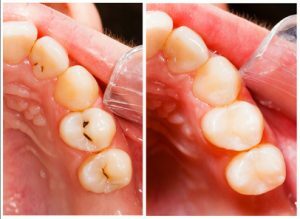 Then they will apply filling to prevent further decay, and to prevent the sensitive inner layers of the tooth from cold, heat or pressure. The filling is applied in layers and hardened with a special light. The final layers are shaped and polished to restore the tooth’s appearance and function.